Remoulade sauce is great on seafood, game, meat, veggies, sandwiches, appetizers and salads. 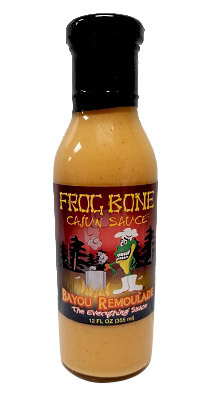 Frog Bone Sauces are a gourmet sauce that will surely hit the spot on all your favorite foods. Frog Bone's Remoulade Sauce is the everything sauce! This Remoulade sauce is great on seafood, game, meat, veggies, sandwiches, appetizers and salads. Great for making Shrimp Remoulade Salads and dipping your seafood in. This product contains eggs and soy.